‪radioBollyFM presents most authentic TOP 10 CHARTBUSTER on every week. 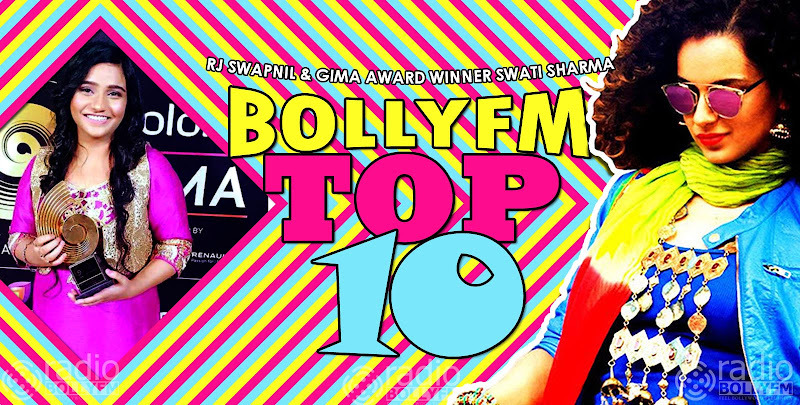 Check out our blog for complete "TOP 10 CHARTBUSTER" song list here http://blog.radiobollyfm.in/top10. Don't forget to tune into www.radiobollyfm.in for the "BOLLYFM TOP 10" radio show hosted by our own RJ Swapnil with new Bollywood celebs on every week. For the first time on our radio we have Swati Sharma with us as our guest, recently she has won 'GIMA AWARD 2016' (Global Indian Music Academy) for the most entertaining song 'Banno Tera Swagger' from the movie 'Tanu Weds Manu Returns'. Catch her on radioBollyFM with our own host RJ Swapnil on BOLLYFM TOP 10 COUNTDOWN show. Stay tuned with www.radiobollyfm.in. Special Guest: Swati Sharma, Singer of Banno Tera Swagger, Winner of Global Indian Music Awards 2016. 24 APRIL 2016, 8PM IST. CLICK HERE TO CHAT WITH RJ. We wish you all the best for your future endeavours and thanks for being with us.